At the State Council executive meeting presided over by Premier Li Keqiang on Sept 12, a decision was made to further cut production permits for industrial goods by over one-third, and simplify the approval procedure. Production permits for goods related to public security, public health and environmental protection will be replaced by mandatory certification. A list of these products will be compiled and released to the public, and certification charges will be funded by public finance. “This move is worth the money, as it is not only for the health and safety of our people, but also helps enterprises to improve quality and upgrade,” Premier Li said. China Compulsory Certification (CCC) is the certification system of production permit administration toward goods relating to public security and health. At the meeting, it was decided that goods relating to public security, public health and environmental protection, which canceled the required production permits, shall be replaced by mandatory certification. A list of these products will be compiled and released to the public, and certification charges shall be funded by public finance. “A concept shall be formed among the public: Goods with mandatory certifications are safe and guaranteed; required goods without compulsory certification cannot enter the market,” Premier Li said. The Premier explicitly stated two requirements: First, compulsory certified goods should be restricted within fields concerning public security, public health and environmental protection. A clear “positive list” should be released to the public. This should be approved by the State Council and related departments, and then carried out according to laws and regulations. Second, compulsory certification should not be an extra burden for enterprises. Certification charges shall be funded by public finance to ensure public safety, thus promoting enterprises’ improved quality and upgrades. “On one hand, unnecessary licenses will be cut; on the other hand, quality certification will be enhanced. While implementing compulsory certification, supportive measures should be used to encourage enterprises willing to be certified. In this way, brand development and market expansion can be promoted,” Premier Li said. At the meeting it was decided to further cut production permits for industrial goods, and to streamline approval procedures — on the premise that quality security and fair supervision are guaranteed. Production permits for 14 types of industrial goods will be canceled, which made the category that requires production permits reduced to 24 from 38. The approval process for production permits will be simplified. Product examination organized by issuing authorities will be changed into submitting qualified test reports by applicant enterprises. On-site examinations for products requiring provincial-level permits can be arranged after the license has been awarded, except dangerous chemicals. A license can be presented as long as enterprises submit related documents and make a quality-security commitment. One license will be issued to one company, regardless of its number of product types. 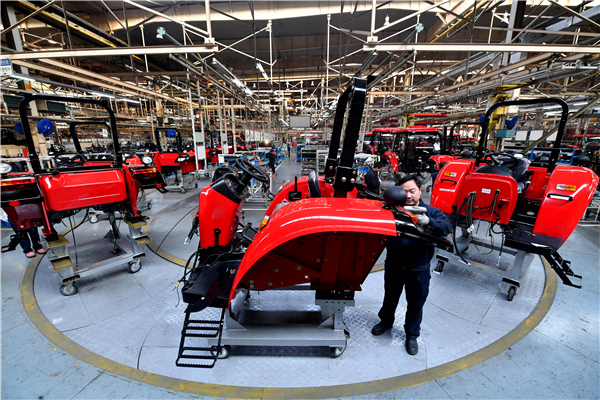 Premier Li said the complication of production permits for industrial goods restricted the development of the manufacturing industry in the past. Unreasonable production permits have been canceled in recent years, which brought a great increase in industrial investment and the manufacturing industry. The Premier stressed that the reform not only simplifies approval procedures for enterprises, but also emphasizes supervision accountability. He stressed relieving the burden from enterprises and adding responsibilities to the government.